1. The Academy of music and arts continue engages and support students who have the great passion to pursue their dreams. 2. We seek to prepare students to get more informed about the career and future educational choices by immersing them in rigorous performance programs which are fused with professional experiences and evolving technologies. 3. Kadambari Sangeet Mahavidyalaya is affiliated by Prayag Sangeet Samiti and Pracheen Kala Kendra. We view the arts as essential to the human spirit. 4. We strive to nurture students who are ready to accept multiple challenges because they have to experience a stimulating and diverse curriculum. KSM offering a various diploma and degrees programs for students. So that they have many chances for experiencing a stimulating and diverse curriculum. Kadambari Sangeet Mahavidyalaya is one of the famous and renowned music academy. We are fully committed to support and nurture the musicians to make them great professionals of the music industry. We have started to train our students at our music academy which has really proved to be a great assistance to them. Our music academy has always stood in the support of the statement that everyone is capable of reaching great height and learning music with great efforts. 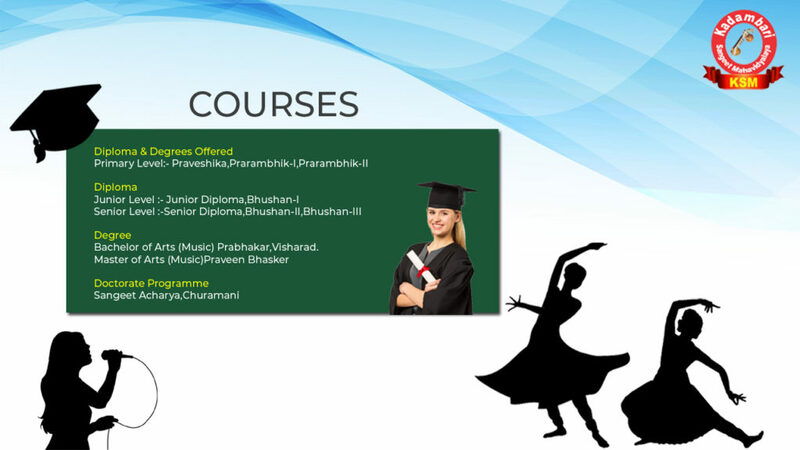 We focus on the development of our students as a performer and perfect music composer. By accessing our state of great art facility and giving your musical career a great necessary boost to reaching the peak of success.